~ John Witherspoon, The Dominion of Providence Over the Passions of Men (1776"
Source: Founders' Quote Database, The Patriot Post. On Wednesday, Citizens Against Government Waste (CAGW) announced the had named House Appropriations Committee Chairman Rodney Frelinghuysen (R-N.J.) its September 2017 Porker of the Month for earmarking $900 million for a massive transportation boondoggle." "On September 14, 2017, the House approved H.R. 3354, the Make America Secure and Prosperous Appropriations Act, which included $17.8 billion for the Department of Transportation. The bill contained a $900 million earmark for the Gateway infrastructure project, inserted by Chairman Frelinghuysen. "The Gateway project consists of a series of “strategic rail infrastructure improvements designed to improve current services and create new capacity that will allow the doubling of passenger trains running under the Hudson River” from Newark, New Jersey, to New York City. "Of the $900 million earmark, $500 million will come from the termination of the wasteful Transportation Investment Generating Economic Recovery (TIGER) grant program and $400 million will come from the Federal-State Partnership for State of Good Repair grant program. The $400 million that Chairman Frelinghuysen earmarked from the Good Repair account was 19 times greater than President Trump’s budget request of $26 million. "For abusing the appropriations process to earmark a wasteful project, CAGW names Rep. Rodney Frelinghuysen its September 2017 Porker of the Month." Citizens Against Government Waste is a nonpartisan, nonprofit organization dedicated to eliminating waste, fraud, abuse, and mismanagement in government. Porker of the Month is a dubious honor given to lawmakers, government officials, and political candidates who have shown a blatant disregard for the interests of taxpayers. For information about CAGW, click here. 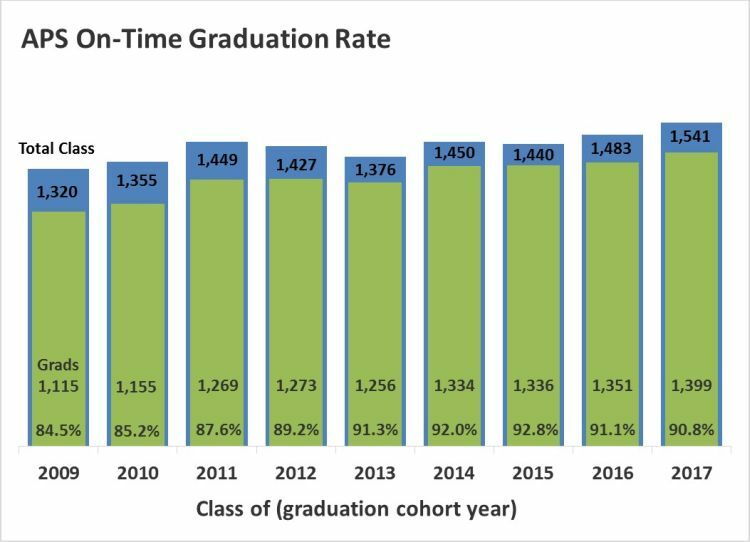 According to a online report today in the Arlington Sun Gazette, "Arlington Public Schools’ on-time-graduation rate dipped slightly in 2017, remaining roughly on par with the state average, according to figures reported Sept. 27." Specifically, "The school system’s on-time-graduation rate of 90.8 percent was down from 91.1 percent a year before and the lowest since 2012." "In a statement, Superintendent Patrick Murphy did not specifically address the decline, but said educators and school staff were striving to provide the best outcomes for all students. “As our school division continues to grow, I am especially proud of our teachers who recognize the importance of meeting the individual needs of each student so they succeed and are ready to take the next steps in their lives to become successful, active, involved and contributing members in our community,” Murphy said. "The school system’s three general high schools – Wakefield, Washington-Lee and Yorktown – had a collective on-time-graduation rate of 96 percent for the Class of 2017. "Statewide, 91.1 percent of students who entered high school four years before graduated on time, the Virginia Department of Education reported, down from 91.3 percent in 2016. For detailed state, division and school reports, which breakdown the numbers by demographic date, click here for the Virginia Department of Education's cohort reports. We growled about APS highest cost-per-student in the region on November 21, 2016. A news story at the Arlington Sun Gazette today says, "Home-buyers in Arlington paid more, on a per-square-foot-basis, for existing homes during the first two-thirds of the year than those in any other Northern Virginia jurisdiction, according to new data." "The average per-square-foot cost of $474 in Arlington for the January-through-August period edged out the city of Falls Church at $451. "Figures were reported by RealEstate Business Intelligence, based on data from Bright MLS." Read the entire story since it contains several more data points. In a story last Thursday in the Arlington Sun Gazette, Scott McCaffrey reported, "In a marathon meeting that crossed midnight Sept. 19-20 and kept chugging, County Board members declined, for now, to endorse the VRE staff proposal to locate the new station east of Crystal Drive between 18th and 20th streets South, several blocks from the existing location." “Option 2 is more optimal for the quality of life in Arlington and in Crystal City,” she said. "But, with the meeting closing in on the 1 a.m. mark, Cristol accepted what board colleague Christian Dorsey proffered as a friendly amendment to remove the word “support” from her motion and simply acknowledge that Option 2 was the preference of VRE staff. "The lone dissent in the 4-1 vote was John Vihstadt, who is opposed to Option 2 in its entirety, preferring another proposal (Option 3) to locate the station east of Crystal Drive near 23rd Street South. "That County Board’s action may mean the VRE board won’t be able to move forward as planned in October to designate Option 2 as its preference, which could delay the planning process. In the long run, however, it might not have a great impact, as construction funds are not yet available." McCaffrey closed by observing, "As County Board Chairman Jay Fisette noted, some of the complaints of Crystal City residents living near the tracks – which have existed for a century and a half under various ownership – have to do more with freight traffic than with passenger service. Arlington officials have held discussions with CSX in an effort to mitigate impacts, where possible." A 5-slide staff presentation on the VRE Crystal City Station Improvements is available. The Manager's report to the County Board (Board Report, Appendix, and Supplemental Report to Agenda Item #56) can be accessed here as part of the September 19, 2019 County Board's recessed meeting. "Eight months ago, we ushered in a new year and a new party in control of the White House, yet the ever-rising national debt seems to be eternal. "Nevertheless, we are periodically treated to the dog-and-pony show that Congress and the president put on whenever the nation is about to bump up against the debt ceiling, which is inevitably raised, but we can’t help but think that things might be even worse if politicians were not forced to at least pay lip service to fiscal restraint. We just wish voters would show more resolve in holding them to their promises of fiscal responsibility. "In the latest debt-ceiling circus, President Donald Trump struck a deal with Democrats this month to boost the debt ceiling in the short term, which should extend the nation’s credit until Dec. 15, and tied this to funding for hurricane relief. As a result, the national debt officially eclipsed $20 trillion for the first time, surpassing a dubious milestone. Even if you remove the $5.5 trillion in intragovernmental debt, which various parts of the government owe to one another, this translates to more than $125,000 per U.S. household. "And the government’s official debt statistic is likely significantly underreported. Adding in other debts like unfunded Social Security and Medicaid promises, Truth in Accounting pegs the total at more than $103 trillion — well north of $800,000 per household — and Boston University economist Laurence Kotlikoff estimates that the figure may exceed $200 trillion. "It would at least be somewhat understandable for the country to rack up massive debt if it was because we were in the midst of a severe economic depression or an existential military conflict, but the debt has continued to rise substantially despite the facts that we are in an extended economic recovery and the federal government is continuing to take in record levels of tax revenue . . . ."
Source: Editorial, "Will Congress ever tackle the national debt?," Orange County Register. Growls readers are encouraged to read the entire editorial. You're likely to bookmark it for future reference, as well as sending a link to your friends. We growled most recently about the national debt on September 13, September 11, and August 18, 2017. HT Real Clear Politics. HT Founders' Quote Database, The Patriots Post. The Arlington County Manager has announced the county is "looking for feedback earlier this year than ever before as we plan for the Fiscal Year (FY) 2019 budget. Join your neighbors for community roundtable discussions about budget priorities and challenges. Your suggestions and comments will help the County Manager shape his FY19 budget proposal, which will go to the Board in February 2018." There will be seven roundtables running from Friday afternoon, September 29 through Saturday morning, October 28, at venues across all of Arlington County with morning, afternoon and evening times. "During the seven roundtables, up to 25 participants will be joined by members of the County’s executive leadership team to learn about the FY 2019 budget process and budget challenges facing Arlington County. Participants also will share their perspectives about budget priorities through a series of discussion questions. The dates, times, and locations are available here. There is also an RSVP link for each roundtable. The Arlington Sun Gazette's news item about the budget roundtable yesterday reported, "Up to 25 participants per event will receive information from senior county staff on the budget process, and will be asked their budget priorities." The importance of these roundtable meetings cannot be overemphasized. When the Manager presents his Proposed Budget in February, the changes the County Board makes before adopting the FY 2019 budget in April primarily involves "making changes around the edges." Most of the changes in the Manager's proposed budget are already baked-in. As a result, decisions made by the Manager in response to citizen input at these roundtables will be more important than ever. Much more important, in the opinion of your humble scribe, than citizen comments at the Budget and Tax Hearings in March. So, attend one of the budget roundtables, and use the opportunity to tell the Manager and staff it's time to hold the line on the local Leviathan. Use the opportunity to really engage with the Manager and his fiscal leaders. Government is Most Important Problem Facing U.S.? CNSNews.com's Michael Chapman reported today, "Gallup's latest survey on the top problems facing the nation shows that goverment, specifically "dissatisfaction with government," is the number one problem that concerns Americans. Gallup added that government has been the number one concern, or among the top concerns, since it started this poll in 2004." "In the survey, Gallup asked, "What do you think is the most important problem facing this country today?" Eighteen percent of respondents said "dissatisfaction with government." "Coming in second was race relations/racism, with 12% saying it was the most important problem. Immigration was third, with 11%. Interestingly, the "situation with North Korea" ranked seventh, with only 6% of respondents saying it was an important problem. I"[D]issatisfacton with government remains at the top of the list," said Gallup. "Unlike some of the mercurial issues that change with current events, dissatisfaction with government is a persistent problem in Americans' minds." "The survey was conducted Sept. 6-10, with a random sample of 1,022 adults, aged 18 and older, living in all 50 states and the District of Columbia. The margin of error was +/- 4 percentage points. " Two other Gallup polls may be of related interest. In a poll, released on Monday, September 18, 2017, seven in ten Americans are dissatisfied with the way the U.S. is being government. In 2016, Gallup found that 33% of Americans were dissatisfied compared to 28% dissatisfied today. According to Gallup, satisfaction was at its highest -- 59% -- in 2002. They also said "satisfaction with governance is related to Congressional approval." In a poll released today, Gallup found "52% in U.S. trust federal government to handle international problems" while "45% say the same about domestic problems." The also found a "(s)harp reversal in Democratic and Republican opinions since Trump's election." 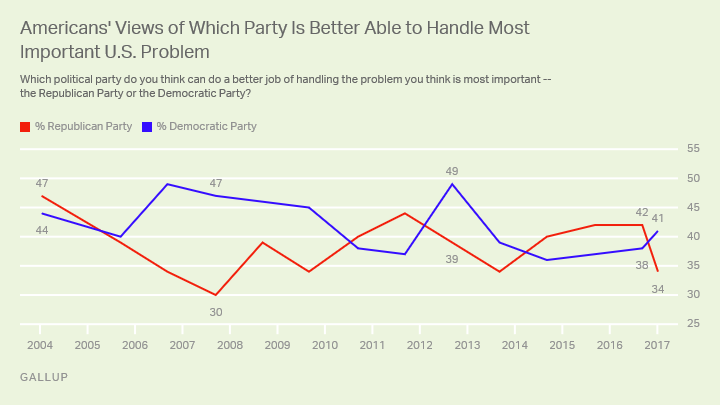 The above Gallup polls are "part of a series focusing on Americans' confidence in various types of government, views of the political parties and of the role and power of government." Look here for Virginia's elected leaders. Be sure to ask for a written response. And tell them ACTA sent you. At the Washington Free Beacon today, Ali Meyer reports, "If Congress were to cut unnecessary and wasteful spending in the federal government, it could balance the budget in three years based on recommendations by Citizens Against Government Waste (CAGW), a nonpartisan organization." For example, the article is sub-titled "Reducing improper Medicaid payments would save taxpayers $4.1 billion in one year." Meyer continues, explaining, "The report, titled "Prime Cuts 2017," outlines 607 recommendations to cut inefficient government spending that would not only balance the budget within three years but also save taxpayers $336.2 billion in the first year and $2.3 trillion over five years." According to Citizens Against Government Waste, which released the report today, "Wasteful government spending can be cut and the nation can start on a path toward fiscal sanity." "By following the blueprint provided by Citizens Against Government Waste Prime Cuts 2017, wasteful government spending would be dramatically cut, and the U.S. would achieve a balanced budget within President Trump's first term," said Tom Schatz, president of Citizens Against Government Waste. "The only way to put the nation on a path toward fiscal sanity is for leaders to make bold decisions to reduce waste, fraud, abuse, and mismanagement." Eliminate the Market Access Program (MAP), a corporate welfare program that funnels taxpayer dollars to large, profitable corporations and trade associations. Eliminating MAP would save nearly $1 billion over five years. Eliminate the $500 million earmark in FY 2017 for the F-35 Joint Strike Fighter program. The F-35 is currently $170 billion over budget and on pace to become the most expensive weapon system in history, including an estimated lifetime cost of $1 trillion for operation and maintenance. Cutting funds for the Community Development Block Grants (CDBGs) has bipartisan support. Former President Obama recommended reducing funding for CDBGs because, “the demonstration of outcomes [is] difficult to measure and evaluate,” and President Trump’s FY 2018 budget would eliminate the grants altogether, saving $3.2 billion in one year. Eliminate the sugar, dairy, and peanut programs, which would collectively save $1.5 billion in one year. Suspending federal land purchases would save $466 million in the first year. Repeal of the Davis-Bacon Act would save $512 million in one year. Reducing Medicare improper payments by 50 percent and increasing the use of software asset management tools would also save taxpayers billions of dollars. The 2017 Prime Cuts report is available here; it includes an introduction and summary for each department. There is also a 2017 Prime Cuts database. The Daily Signal's Fred Lucas reported today that "President Donald Trump praised the new leadership of the United Nations on Monday for promoting reform in the global body, often criticized for bloated bureaucracy, ineffectiveness, and scandal." "Trump and U.N. Secretary-General Antonio Guterres both ascended to their respective offices this year and have demanded change going into the 72nd United Nations General Assembly gathering this week. "During remarks Monday in New York at an event on reform attended by representatives of 120 of the 193-member U.N., Trump told Guterres “you have been fantastic” in promoting reforms. "The president specified changes to encourage more financial burden sharing, provide greater whistleblower protections for U.N. staff who report wrongdoing, streamline bureaucracy, and demand better-defined peacekeeping missions. "Guterres, elected last year, assumed office Jan. 1. He was prime minister of Portugal from 1995 to 2002, where he ran on the Socialist Party ticket. He has been a staunch advocate for more countries to accept Syrian refugees. "Trump was scheduled to address the full U.N. General Assembly on Tuesday. "In his brief remarks Monday, Trump said the U.N. was founded in 1945 on noble goals, such as affirming the dignity of every person, striving for international peace, and advancing humanitarian efforts around the world. Trump noted the U.N. bureaucracy has doubled since 2000." We've growled about the Paris Climate Accord Agreement -- most recently here and here, but on August 14, 2010, we growled about the cost of the United Nations to American taxpayers. "In 2004 under Senator Byrd's urging, Congress changed the designation of this day to "Constitution Day and Citizenship Day" and added two new requirements in the commemoration of this Day. The first is that the head of every federal agency provide each employee with educational and training materials concerning the Constitution on September 17th. The second is that each educational institution which receives Federal funds should hold a program for students every September 17th." Source: Overview of Constitution Day and Citizenship Day. Library of Congress. The Library of Congress provides references to legislative and executive branch documents, journal articles and web resources. Source: ThinkExist.com. HT July 8, 2017 "The Week that Was," newsletter of Science & Environmental Policy Project. At CNS News today, Terry Jeffrey reports, "The three richest counties in the United States with populations of 65,000 or more, when measured by their 2016 median household incomes, were all suburbs of Washington, D.C., according to data released today by the Census Bureau." "Eight of the 20 wealthiest counties with populations of 65,000 or more were also suburbs of Washington, D.C.--as were 10 of the top 25. "Loudoun County, Va., with a median household income of $134,464, was nation’s wealthiest county, according to the Census Bureau. "Loudoun was also the wealthiest county in 2015. But from 2015 to 2016 its median household income increased by $8,564--rising from $125,900 to 134,464. 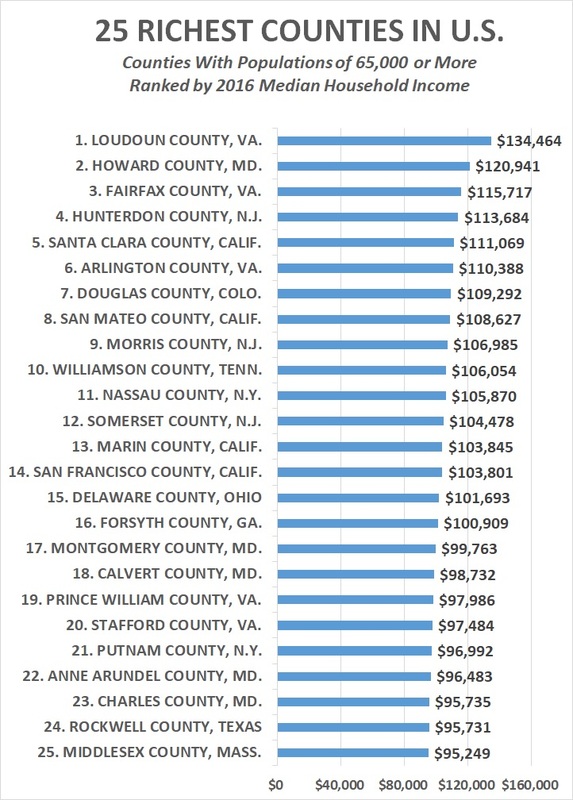 "Howard County, Md., with a median household income of $120,941, was the nations’ second wealthiest county. Fairfax County, Va., with a median household income of $115,717, was the third wealthiest." He also noted, "In data that the Census Bureau released in December 2016--giving the 2015 median household incomes for all counties regardless of their population--Falls Church City had finished as the nation’s second wealthiest county (behind Loudoun) with a median household income $122,092. However, the current Census Bureau data includes only counties with populations of more than 65,000. As a result, Jeffrey points out, "With Falls Church City included in the 2015 data, the nation’s four wealthiest counties were D.C. suburbs." We growled on December 13, 2012 after the Arlington Sun Gazette reported that Arlington County ranked No. 6 nationally based upon 2011 household income. At the time, Loudoun County ranked No. 1 while Fairfax County ranked No. 3. Maryland's Howard County made the big move, climbing from No. 5 to No. 2. The Census Bureau's September 14, 2017 press release (number CB17-157) includes "statistics for more than 40 demographic and economic topics." For an additional view of household incomes in Virginia, Jim Bacon, Virginia's peerless policy blogger, provides a chart that includes Charlottesville, Richmond, Virginia Beach, Roanoke, and Winchester at Bacon's Rebellion today. Guess when you rank No. 6 among America's wealthiest counties, as Arlington County does, you don't need to include anything about local government efficiency in your Vision Statement, which is included in most County documents. The Arlington Sun Gazette reported today (online), "All of Arlington’s public schools have won full accreditation for the 2017-18 school year, according to state officials, making the school district one of 65 out of 123 divisions with 100-percent accreditation." "All county schools had been fully accredited for the past three years. "The Virginia Department of Education reported accreditation results on Sept. 13. "Statewide, 1,573 of the commonwealth’s 1,823 public schools are rated as full accredited for the coming year. The 86-percent accreditation rate is an improvement from 81 percent a year ago." Given that the Arlington Public Schools are the costliest in the region -- see our November 21, 2017 Growls -- and most likely the costliest in the Commonwealth, the taxpayers of Arlington County should accept nothing less than all of its schools receiving full accreditation from the Virginia Department of Education. At CNS News today, the incomparable Terry Jeffrey writes, "The federal government collected record total tax revenues through the first eleven months of fiscal 2017 (Oct. 1, 2016 through the end of August), according to the Monthly Treasury Statement." "Through August, the federal government collected approximately $2,966,172,000,000 in total tax revenues. "That was $8,450,680,000 more (in constant 2017 dollars) than the previous record of $2,957,721,320,000 in total tax revenues (in 2017 dollars) that the federal government collected in the first eleven months of fiscal 2016. "At the same time that the federal government was collecting a record $2,966,172,000,000 in tax revenues, it was spending $3,639,882,000,000—and, thus, running a deficit of $673,711,000,000. "Individual income taxes have provided the largest share (47.9 percent) of federal revenues so far this fiscal year. From Oct. 1 through the end of August, the Treasury collected $1,421,997,000,000 in individual income taxes. "Payroll taxes provided the second largest share (35.9 percent), with the Treasury collecting $1,065,751,000,000 in these taxes. "The $233,631 in corporate income taxes collected in the first eleven months of fiscal 2017 equaled only 8.6 percent of total tax collections. "The $21,172,000,000 collected in estate and gift taxes equaled only 0.71 percent of total taxes collected this fiscal year." Take a minute or two to read Jeffrey's report at the CNS News website since he includes two helpful charts. Consider where America is headed. Earlier today, Senator Bernie Sanders (I-Vermont) "unveiled his Medicare-for-All legislation at the U.S. Capitol Wednesday afternoon," according to CBSNews.com, which Sanders' website explains is "The only long-term solution to America's health care crisis." Add to that the fact that, as we growled on Monday, the national debt officially topped $20 trillion this past weekend. And if you like really big numbers, Boston University Laurence Kotlikoff estimates America's fiscal gap at $211 trillion, as we growled on June 30, 2011, and that was six years ago. "We cannot blame politicians for the spending that places our nation in peril. Politicians are doing precisely what the American people elect them to office to do -- namely, use the power of their office to take the rightful property of other Americans and deliver it to them. It would be political suicide for a president or a congressman to argue as Madison did that Congress has no right to expend "on objects of benevolence" the money of its constituents and that "charity is no part of the legislative duty of the government." It's unreasonable of us to expect any politician to sabotage his career by living up to his oath of office to uphold and defend our Constitution. That means that if we are to save our nation from the economic and social chaos that awaits us, we the people must have a moral reawakening and eschew what is no less than legalized theft, the taking from one American for the benefit of another." The Washington Post's Heather Long reported this evening, "The incomes of middle-class Americans rose last year to the highest level ever recorded by the Census Bureau, as poverty declined and the scars of the past decade’s Great Recession seemed to finally fade." "Median household income rose to $59,039 in 2016, a 3.2 percent increase from the previous year and the second consecutive year of healthy gains, the Census Bureau reported Tuesday. The nation’s poverty rate fell to 12.7 percent, returning nearly to what it was in 2007 before a financial crisis and deep recession walloped workers in ways that were still felt years later. "The new data, along with another census report showing the rate of Americans lacking health insurance to be at its lowest ever last year, suggest that Americans were actually in a position of increasing financial strength as President Trump, who tapped into anger about the economy, took office this year." Nevertheless, she writes, "the census report also points to the sources of deeper anxieties among American workers and underscores threats to continued economic progress," noting for example, "Middle-class households are only now seeing their income eclipse 1999 levels." She also said economists question "whether the gains will continue." "The income increase extended to almost every demographic group, Census Bureau officials said. The figure the agency reported Tuesday was the highest on record. The agency reports that in 1999, median household income, adjusted for inflation, was $58,655. Agency officials cautioned that the bureau changed its methodology in 2014, complicating an exact historical comparison." The data comes via a Census Bureau press release today titled, "Income, Poverty and Health Insurance Coverage in the United States: 2016." According to the press release, Census will release single-year estimates, including median household income, for all states, counties and "other geographic units with populations of 65,000 or more from the American Community Survey" on Thursday, September 14. "Inequality remains high, with the top fifth of earners taking home more than half of all overall income, a record. And yawning racial disparities remain, with the median African American household earning only $39,490, compared with more than $65,000 for whites and over $81,000 for Asians." The Census Bureau made two points about income inequality, however. First, they noted the change in income inequality, as measured by the "Gini index was 0.481 in 2016; the change from 2015 was not statistically significant." The Census Bureau also reported that "household income in the fourth quintile decreased 1.3 percent between 2015 and 2016, while changes in the shares of other quintiles were not statistically significant." Guess it's just a matter of perspective, eh? Or maybe just a little bit of liberal bias seeping in? CNS News' Terry Jeffrey reports on the latest national debt numbers today, writing, "The federal debt officially surpassed $20 trillion for the first time on Friday, as the debt subject to the legal limit set by Congress jumped $317,645,000,000 in one day--following President Donald Trump's signing of a spending-and-debt-limit deal that will fund the government through Dec. 8." "At the close of business on Thursday, Sept. 7, according to the Daily Treasury Statement for Friday, the total debt of the federal government was $19,844,587,000,000 and the portion of it subject to the legal limit set by Congress was $19,808,747,000. After President Trump signed the legislation suspending the debt limit, the total debt immediately jumped to $20,162,177,000,000 and the portion of it subject to the limit jumped to $20,126,392,000,000, according to the Daily Treasury Statement for Sept. 8, 2017. "That means the total debt jumped $317,590,000,000 on the day it officially topped $20 trillion for the first time and that the part of the debt subject to the legal limit jumped $317,645,000,000 on that day." Jeffrey includes three "screen shots" of Table III-C, Debt Subject to Limit, to further explain and memorialize the topping of the $20 trillion debt limit. The two-page Friday, September 8, 2017, Daily Treasury Statement, is available here. "The U.S. has exceeded $20 trillion in national debt — the nation was a cool $20.16 trillion in the red as of Friday — and now that it’s crossed that mark, get ready for some finger pointing over who’s to blame. "If history shows anything, it’s that both parties share responsibility for boosting the debt. Fighting wars, big tax cuts and economic stimulus packages have all added to the burden over the years." MarketWatch included the following chart showing "key moments leading to a $20 trillion national debt. The Daily Wire also reported the national debt hitting $20 trillion for the first time. We've growled frequently about the national debt. On August 18, 2017, we growled that the national debt exceeded GDP. On April 24, 2017, we offered a thought about the national debt. We also growled on February 21, 2017 because household debt exceeded $12.58 trillion. In addition, we growled on January 24, 2017 because the federal government flunked its FY 2016 annual audit. UPDATE (9/12/17): Rep. Jim Jordan (R-Ohio). co-founder of the Freedom Caucus talked about the increase of the debt limit on Fox News on Sunday. As reported by CNS News, he "told “Fox News Sunday” that the deal that President Donald Trump struck with House Democratic Leader Nancy Pelosi (D-Calif.) and Senate Minority Leader Chuck Schumer (D-N.Y.) last week on the debt ceiling was not “a good deal for the American taxpayer,” but Trump didn’t have many options in front of him at the time." "There are many who find a good alibi far more attractive than an achievement. For an achievement does not settle anything permanently. We still have to prove our worth anew each day: we have to prove that we are as good today as we were yesterday. But when we have a valid alibi for not achieving anything we are fixed, so to speak, for life." HT Thomas Sowell's Favorite Quotations. According to Wikipedia, "Eric Hoffer (July 25, 1898 – May 21, 1983) was an American moral and social philosopher," and "the author of ten books and was awarded the Presidential Medal of Freedom in February 1983. His first book, The True Believer (1951), was widely recognized as a classic . . . ." The quotation is on page 181 of Hoffer's "The Passionate State of Mind," Barnes and Noble adds that Hoffer "lived for years as a Depression Era migratory worker. Self-taught, his appetite for knowledge--history, science, mankind--formed the basis of his insight to human nature. The Passionate State of Mind is a collection of timeless aphorisms taken from his brilliant writings." Is Ridership on Arlington's "Little Green Buses" Really Up? "The county-government-funded, privately run transit network saw a 9.1-percent increase in riders in the fiscal year that ended in June, making it one of the very few transit lines – rail or bus – to see positive year-over-year growth. "But the increase came largely due to declines in rail travel due to the Metro system’s SafeTrack effort, according to the Northern Virginia Transportation Commission, which on Sept. 5 released fiscal-year ridership data for all transit networks across the Washington region." "In total, 3.42 million rides were taken on ART buses in the 12-month period beginning July 1, 2016, according to the figures, up from 3.14 million the year before. "The increase stands in contrast to the overall transit ridership in Northern Virginia, which declined 9 percent to 134.2 million rides during the fiscal year. "That 13.2-million drop in passengers was due mostly to a 12.1-million-trip decline in the Virginia portion of the Metrorail system, which saw its passenger count plummet from 101.6 million to 89.5 million as riders fled the system – some temporarily, but perhaps some permanently. "Excepting the ART system, other inner-suburb bus systems posted passenger declines: Fairfax County Connector saw its passenger count dip 3.9 percent to 8.63 million, while Alexandria’s DASH was down 6.3 percent to 3.9 million. Loudoun County Transit, Fairfax City’s CUE and OmniRide (serving Prince William County) also showed declines." The Sun Gazette also points out, "The growth of the ART system came largely on two routes – 55 and 43 – which saw more frequent service to accommodate those displaced by SafeTrack surges. “However, several other ART routes had fewer rides in FY2017 as compared to the previous year,” analysts noted. And for the last three months of fiscal 2017, ridership on the ART system was down slightly (0.5 percent) from the same quarter a year before." Finally, the article provides statistics about the number of residents living "within a half-mile of bus service" compared to other Northern Virginia jurisdictions. The Northern Virginia Transportation Commission provides preliminary quarterly reports on ridership, which you can access here. The data is provided to NVTC by local and regional transit service provides. The data is finalized when published in NVTC's Annual Transit Performance Update. "Contractual expenses were added for the full-year funding to Arlington Transit (ART) routes 43 and 92 ($591,750), contractual increases for existing ART and STAR services ($534,514), ART light maintenance facility operating ($157,500) and maintenance ($106,558) costs, and increases in the Commuter Services Program ($579,063). Transit service costs are partially offset by fare revenue, reimbursement from the State for transit operations, funding from the Transportation Capital Fund and NVTA local funding." The Adopted Budget also shows, "The County Board adopted an ART fare increase of $0.25 per trip, which is expected to generate $250,000 in additional fare revenue." We've growled about ART ridership and ART operations several times in the past three years: 1) April 30, 2015; 2) February 14, 2016; and, 3) August 31. 2016. For the record, DES expenditures were 6% greater in the FY 2018 Adopted Budget than in the FY 2017 Adopted Budget while Transit Program spending was 9% greater in the FY 2018 Adopted Budget than in the FY 2017 Adopted Budget. A Thought About "The Swamp"
According to Scott McCaffrey in an online Arlington Sun Gazette article today, "The challenges inherent in reforming operations and governance of the Metro system were summed up neatly during a Sept. 6 forum featuring the elected leaders of Northern Virginia’s five largest jurisdictions." He clarifies, continuing"
"Asked for a show of hands on whether the number of board members of the Washington Metropolitan Area Transit Authority needed to be reduced, the group split – 2.5 to 2.5. "“Let me clarify . . .” said Arlington County Board Chairman Jay Fisette (D), whose half-a-hand up caused the unlikely 50/50 split. "The moment was a small but telling one during the forum, sponsored by a group of business organizations. Everyone has thoughts about what ails the beleaguered transit agency, but consensus on how to fix it remains elusive." "Sharon Bulova, chairman of the Fairfax County Board of Supervisors, believes the solution lies, at least in part, in Richmond. “The answer will eventually need to be in the General Assembly. Give us the flexibility to find the source of revenue that works for us,” Bulova said. "While the transit system may be facing up to some of the backlog of problems it faces – from declining ridership to deteriorating infrastructure – there remains no consensus on how to provide a consistent stream of future funding from among Virginia, Maryland and the District of Columbia. “Just splitting it a third and a third and a third isn’t fair to Virginia,” Bulova said, pressing to keep the longstanding, more complicated revenue agreement in place. “That has been fair, and it will be fair,” she said. "But District of Columbia leaders are griping about maintaining the status quo, saying it penalizes their city. "Loudoun County does not yet have Metrorail service, but will eventually get it when the Silver Line is completed, so the county is being pulled into the funding fray. "Phyllis Randall, who chairs the Loudoun Board of Supervisors, said the onus should be on the federal government to get the system on track, and keep it that way. McCaffrey closed by noting one proposed solution would be a one cent sales tax, but added, "None of the elected officials explicitly ruled out the idea, nor did any publicly embraced it as their top choice, during questioning at the forum." The Washington Times reported on Monday that the Social Security Administration is paying "millions to people the VA (Veterans Administration) says are dead." "The Department of Veterans Affairs knew they were dead, but the Social Security Administration kept paying benefits to hundreds of people anyway, according to a new agency audit released Friday that says at least $37 million in bogus payments were made. "Investigators compared the VA’s record to Social Security rolls and found nearly 4,000 people who were listed as dead by the VA, but were still getting checks. Some of those people listed as dead were in fact still alive, but others were deceased — and their checks never should have been paid, the Social Security inspector general said. "Among the dead veterans was one who died in August 2008 but continued to get checks until March of this year, when the inspector general got a report from the State Department showing he had died abroad, in Thailand. Social Security paid out $160,000 in bogus payments in that case. "Based on our sample results, we estimate SSA issued approximately $37.7 million to 746 individuals after they died, and will issue approximately $7.3 million more over the next 12 months if these discrepancies are not corrected,” investigators said. "The 746 figure actually may be a dramatic understatement of the problem. "It was based on a sample of 100 veterans the VA said were dead but whose names never were shared with Social Security. Of those, the audit was able to determine the status of only 30 people: 19 of them were deemed dead while 11 others were still alive, despite the VA’s records. "The other 70 cases couldn’t be determined, meaning there could be many more who actually are dead but still getting payments. "Social Security blamed the VA, saying the department wasn’t sending accurate information over." "In addition to the basic problems of dead veterans’ data not being shared, the audit uncovered a number of instances of identity fraud using veterans’ Social Security numbers. "In one instance an Army veteran died in 1980, but someone else used the veteran’s number to work from 1978 through 1991. The person then applied for retirement benefits — collecting some $200,000 over the years. "Another Army veteran who died in 2011 had been getting disability checks from Social Security up through this year — totaling $155,000." At the Washington Free Beacon today, Elizabeth Harrington also reported this story. Perhaps Members of Congress should be more concerned with providing oversight of government agencies rather than spending time figuring out how to create greater dependency by handing out ever more federal benefits. According to the New York Post's Gregory Bresiger yesterday, "It turns out the average American works harder than our Japanese counterparts or the average European worker," reporting on a study by NationalToday.com, which conducted a survey of 2,000 Americans. “Statistics show that Americans work longer hours than the majority of other countries — 137 hours per year more than Japanese, 260 per year more than in the UK,” according to the study. "By the way, when the comparison is made between the average French worker and the average American worker, we’re talking vive la différence. The American worker records about 500 more working hours per year than his or her French counterpart. "“It’s the reason we can say ‘Thank God it’s Friday.’ Labor Day is a time to celebrate the benefits we enjoy at our jobs — including weekends off,” Bagot adds." Two-thirds of Americans over 21 will quaff a brew this weekend. Two-thirds of Americans will also host or go to a barbecue. Americans’ favorite barbecue choices are burgers, dogs, chicken and steak. The majority of those polled from every region of the nation say they’ll be at a barbecue, although outdoor chow-downs are the most popular in the East. "Americans have been outworking everybody else for decades. But what matters is how productive the American worker is. And while the French look like slackers compared to Americans when it comes to the number of hours worked, they finish ahead of us in the rate of GDP to hours worked – a key measurement of productivity. On that list, Germany ranks first, while the U.S. comes in third – behind France. "The revolution in the workplace is already underway and will affect the U.S. worker in ways we can only imagine. The key for all of us (not near retirement) will be adaptability. Possessing the job skills to ensure employability for the future will be key, as will continuing education and training. "Do you think you know what you'll be doing ten years from now? On that question – not how many hours you work – will rest your future." Moran links to an Inc. magazine article by Jessica Stillman on "Which County has the most Productive Workers?" Here's hoping you and your family had an enjoyable Labor Day, today. The Arlington Sun Gazette reported on Thursday that "Arlington retained its poll position with the lowest jobless rate in the commonwealth in July, with the reported unemployment rate percent down a tick from a month before." "With 149,407 county residents employed and 3,854 looking for jobs, the county’s jobless rate of 2.5 percent was down from 2.6 percent a month before, lowest among Virginia’s 133 cities and counties. "Locality-specific figures were reported Aug. 30 by the Virginia Employment Commission." "Corporations and even investors themselves often hire consultants who wrote the law or rule in question. Those with knowledge of what the Dodd-Frank law actually means can command salaries as high as $1 million from hedge funds. "Lawyers with Dodd-Frank Act and regulatory expertise are being wooed by private equity firms and hedge funds in need of an in-house compliance team," reported the New York Law Journal in 2012. "For congressional staffers used to making 10 percent of that, it's a huge payday. Senator Ron Johnson was first elected to the U.S. Senate in 2010 from the state of Wisconsin. A businessman and entrepreneur, he has hired plenty of people over the years. When it came to hiring congressional staffers for his new job, he was struck by a phrase that some applicants used during the interview process: "cashing in." As in "I want to work in public service for a while, before cashing in." "I had never heard that term before when hiring someone in the private sector," Johnson says. Time spent working at a lobbying firm or at a consultancy is "cashing in." Some people work on Wall Street until they have enough money to "cash out." In Washington, they set themselves up for those jobs in order to cash in.."
Source: pages 117-118, "Extortion: How Politicians Extract Your Money, Buy Votes, and Line Their Own Pockets." "We do not seek an America that is closed to the world; we seek a world that is open to America. We do not dream of protecting America from others' success; we seek to include everyone in the success of the American dream." Source: "Radio Address to the Nation on the Farm Industry, September 14, 1985," The American Presidency Project, University of California Santa Barbara.